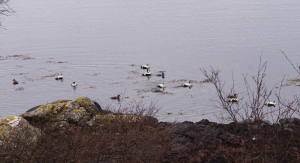 Observation - Common Eider - UK and Ireland. Description: We heard these long before sighting them. Counted twelve males and four , i think immatures? We heard these long before sighting them. Counted twelve males and four , i think immatures?